With the Disney holding back on many of the merchandise licences from the Marvel characters it currently does not have the movie rights for, this has opened the statue market up for custom statue makers to supply the goods that companies like Sideshow, Kotobukiya, Primeone, Xm Studios… are restricted with. This can be the licencing side, but also this can be the creative side. I believe that now Disney owns Marvel the days of seeing Wolverine with a cigar in his mouth are long gone. Even Disney were said to have told to remove a wine glass from the amazing upcoming Medusa piece. Fox had some terrible reviews of it’s recent release on the re hashed Fantastic4 movie (which I personally refuse to watch until it is on Netflix and there is really nothing else to watch!) which caused an uproar from fans for FOX to return the movie rights back to Disney, even resulting in a few online petitions on social media. 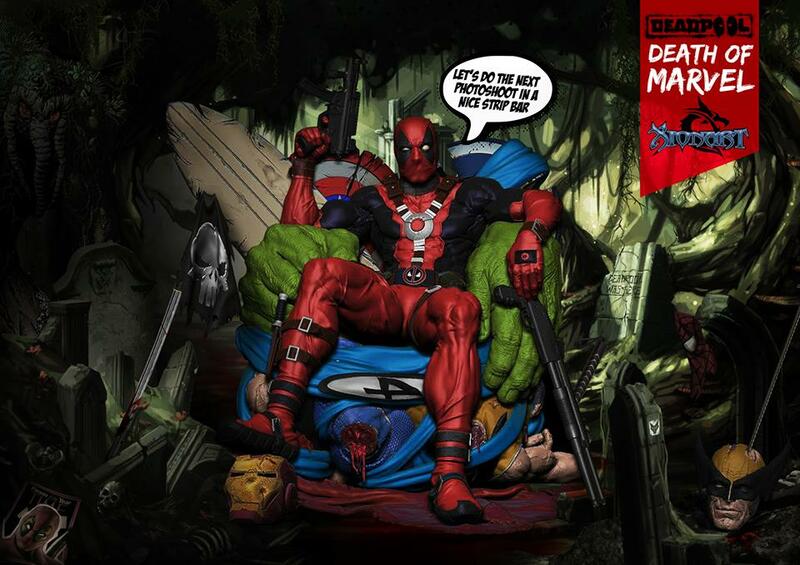 But then there is the up and coming Deadpool movie to be released in February 2016. This movie looks like it will be a hit and it Disney had the movie rights for this it would never have been lined up to received an R rating (15 or 18 in uk) and would have resulted in the movie being a more family friendly movie not worthy of the Deadpool character. As in most situations when the movie is released the statues for these piece shoot up in price. I was offered an EX Sideshow collectibles Red Deadpool shortly after release for cost, but now you are looking at over double the original sales price for this piece. There is the option for the currently more affordable Grey X-Force variant, which is still a great piece to have in your collection, but I will always lean to the Red or even consider having the Grey custom painted Red. This takes me to two amazing customs of Deadpool I have seen floating around on social media. I know I am not allowed to say this and I will cover it with in the piece descriptions, but with both pieces being “Throne” pieces and 1/4 scale they would both fit nicely into my collection, or I would make them. First off we have this awesome piece by Xionart. I have been lucky enough to have been receiving updates on this piece as they happened. Sneak peeks of sketches and snippets of information regarding the elements making up the very detailed base, to the extra heads and even the Dog-pool that attaches to the base. I have to say at times it was hard for me to keep my mouth shut. This piece is loosely based on the “Deadpool Kills the Marvel Universe”. The concept of a marvel character sitting of a pile of heroes chopped to pieces I believe could only be pulled off by Deadpool without seeming too grim. I will be adding the new photos of the Throne and the final painted piece once they are released. If you look in the Gallery of this you can see how huge the final piece will be. If this is done correct this piece is going to be epic on so many levels. I am super excited to see this complete. I could not talk about a custom Deadpool without mentioning this new design by Courtmasters Studios. Sadly this is only a one off commission for a customer, but I will put the photos up for you to also enjoy.